A special thank you to everyone that participated and attended. This year’s show was bigger and better. Our banner blew down early and was quickly re-located on a couple of folding tables. The 1963 CCM Imperial Mark III in the foreground soon found a good home. A couple of souped up CCM Flytes. 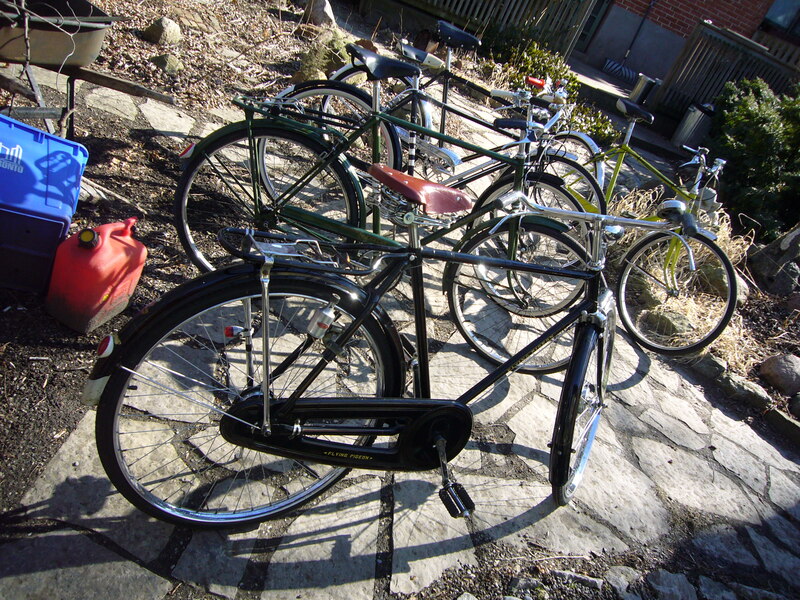 A trio of vintage Raleighs. A 1967 5 speed Sprite (quite rare), a 1973 Superbe and a 1976 Tourist. Roger T. brought his 1885 Penny Farthing and invited the brave to climb aboard. A crazy hump back Schwinn. A trio of Superbes arrived. Another satisfied Customer. Jet Fuel arrived with a good selection of vintage CCM’s. A nice ladies’ Tourist on display Andrew’s CCM Flyte. Martin from Hoop Driver Cycle did a brisk business. Another CCM Imperial Mark III in very good condition. Dan’s Western Flyer got a lot of attention. As well as a N.O.S Raleigh Tourist. These 2 bikes both found a new home. Spotted in the Market a Hercules bicycle built in India, year unknown. Based on the Raleigh Tourist these bikes are still produced by the thousands. Very similar to the Flying Pigeon from China. The owner added the Brooks saddle and the quart of milk.